Villa began the game in the same shape in which they finished Monday night’s game against Arsenal, lining up in a 4-1-2-1-2 (also known as the diamond formation). Antonio Luna was unlucky to miss out at left back, given his performance in that game, with Ryan Bertrand preferred to him this evening. Luna has struggled against direct wingers like Raheem Sterling this season however, most notably against Antonio Valencia in the recent fixture against Manchester United. Injured Baker and Lowton also dropped out, with Bacuna coming in at right back, and Andy Weimann playing as the trequartista behind the strike partnership of Gabby Agbonlahor and Christian Benteke. In the interest of getting Suarez and Sturridge back together again, Liverpool abandoned the 4-3-3 shape that they fielded against Stoke, preferring to plumb for the 4-4-2 that they finished that game with. Lucas made way for the returning former Chelsea striker, with Steven Gerrard moving up to partner Henderson in midfield, after a failed experiment playing in the anchorman position last week. The opening 25 minutes of the game was Villa’s. The way in which the two shapes matched up meant that Villa had a 4 v 2 in the middle of the pitch (this was erroneously referred to as a 3 v 2 or “an extra man” by Alan Smith on Sky numerous times, presumably due to the pre-match graphic rather than any actual evidence visible on the field of play). Incredibly, given that Villa couldn’t manage 30% of the ball in a recent home tie against Southampton, they enjoyed a whopping 61% of it in the first 16 minutes of this game. Liverpool were being swamped in the middle of the field, and were unable to work the ball forward through Gerrard and Henderson. Gerrard only attempted 16 passes in the first half, completing a mere 75% of them, and attempting none of his trademark long passes to the flanks. Henderson was twice as involved, but just as inaccurate, with a 73% pass completion ratio. Villa’s pressing was fierce and effective, but then, given their 2 man advantage, it ought to have been. Huge credit must go to Villa for maximising their period of dominance. They paired their aggressive midfield pressing with a very direct passing style, looking to go long to Christian Benteke at every opportunity. Indeed the very first minute of the game demonstrated this – a long ball from Bacuna was won in the air by Benteke in Liverpool’s right back position. Skrtel was the man who came out to challenge, leaving space for Agbonlahor, who ran off Toure, but couldn’t finish. Over the course of the game, Bacuna to Benteke was the third most common passing combination (14). The most common? Goalkeeper Guzan to Benteke (16). That tells you all you need to know about Villa’s approach, and about how heavily the Belgian dominated his Liverpool counterparts in the aerial battle. The first goal came in the 25th minute, from a fantastic counter attack. Delph collected the ball in his own half, passed to Benteke, who had pulled to the left flank, dragging his marker with him. He played Agbonlahor through down that side. Agbonlahor beat Toure far too easily before crossing to Weimann, who had ghosted in behind marker Gerrard to score. That summed the Liverpool captain’s half up. Acknowledging that his 4-4-2 had left his side woefully exposed, Rodgers made a change. He instructed inside left Coutinho to play behind Sturridge and Suarez. Johnson became a third centre back, with Sterling now at right wing back. it was the 3-5-2 that Liverpool had often utilised at the beginning of this season. This shift meant that Liverpool now had 3 in the centre and could work the ball forward more effectively. It also meant the presence of a spare man against Villa’s strike pairing. They finished the half with 52% of the possession, an impressive recovery. Their new found ascendancy was not immediately effective on the scoreboard however. In the 36th minute, Villa made it 0-2. An Agbonlahor cross was badly misjudged by keeper Mignolet. Benteke finished, unmarked at the back post, with his head (appropriately). There was a sucker punch to come for Villa however. Right on the stroke of half time, Liverpool capitalised on the their own period of dominance with a goal that got them back into the tie. Henderson ran from his left of centre midfield position to the right hand side, just outside the penalty area. His marker El Ahmadi followed him, but allowed him to go behind him. He was unsighted when Henderson received a pass from Suarez, allowing the Liverpool midfielder to play the ball through for Sturridge to finish. The second half began with a change for Liverpool. They flipped the triangle in midfield by removing Coutinho, and bringing on Lucas behind Gerrard and Henderson. Immediately Gerrard looked like the shackles were off, as he now had the freedom to influence the game higher up the pitch. 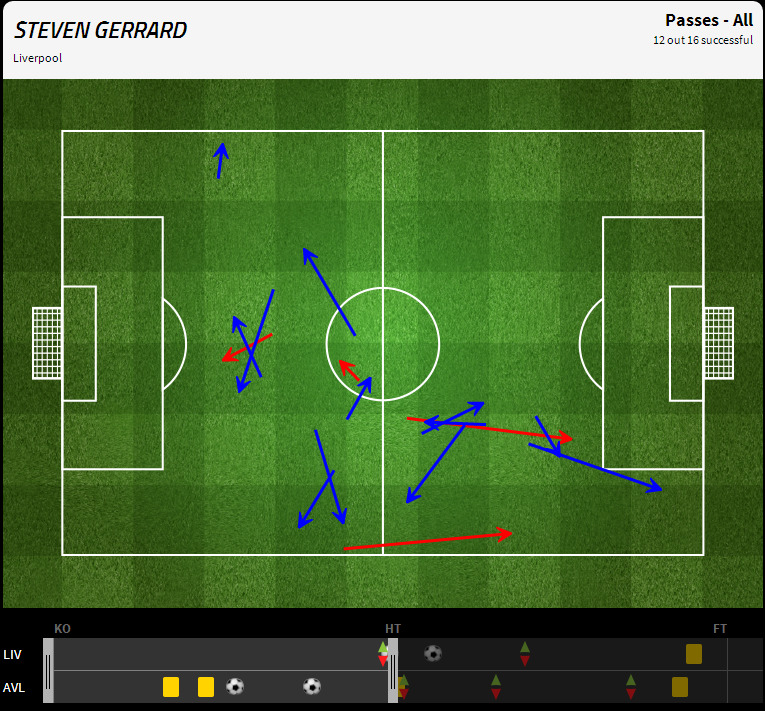 His long passing returned too, completing 5 out of 8 attempted in the second 45. One of them led to the equaliser. In the 52nd minute, Gerrard, unpressed by his marker Delph, was given the time and space to launch a long pass in behind Ron Vlaar. Suarez got on the end of it, beat Guzan, and was adjudged to have had been fouled by the American. Gerrard converted the penalty. Villa were dropping off now. The midfield pressing of the first half had vanished as they looked to minimise the space in behind. They were struggling massively down the flanks against Liverpool’s wingbacks Cissokho and Sterling. As Villa weren’t fielding any wide players, those two were unoccupied and free to make unchecked forward runs. When Agbonlahor came off injured in the 50th minute, Lambert should have taken that opportunity to introduce a wide left and move Weimann to the right flank, thus pinning back Liverpool’s free wingbacks and creating overloads in wide areas. Instead he chose to introduce another target man in Grant Holt, preserving the 4-1-2-1-2 system. Holt was awful, wasting a great opportunity, attempting only 14 passes and completing a mere 43% of them. Given that they already had a big man winning headers in Benteke, it was a baffling switch. Luckily for Villa, it didn’t cost them the game. Sterling and Cissokho were both poor on the day. Sterling lost the ball through a poor touch or being dispossessed a massive 9 times. he completed 0 crosses out of only two attempts. To his credit, he did cause problems with his dribbling, drawing fouls and winning free kicks in dangerous areas, but given that he was one-on-one with Villa’s left back (Bertrand/Luna) for the majority of the game, his end product was not acceptable. A bittersweet one for Paul Lambert and Aston Villa. They outplayed Liverpool in the first quarter of the game with some excellent direct play and midfield pressing, maximising their advantage in the middle of the field. Brendan Rodgers, however, showed a greater ability to react, switching to a 3-5-2 after the first goal, ensuring both control of the midfield area and an extra man against Villa’s front two. The obvious response from Lambert was to go 4-3-3, pinning back Liverpool’s wingbacks and creating overloads on the flanks, but he didn’t do it. A draw was the fair result. i agree that rogers reacted well but overall very disappointed in the performance. no energy in the first 30 minutes except for Henderson but as you say the midfield was being swamped. most disappointed with the full backs first and foremost. johnson never got on the ball going forward and as for cissokho he is one of the worst footballers i have seen wear a liverpool shirt and that is quite a number of bad footballers. you sat he was ”poor on the day”, but ive yet to see him be anything but poor. also when they got back level they seemed to completely drop the urgency and the winner never looked like coming. the three main things i take from the game are, 1. let gerrard play with more freedom rather then restricting him to a holding roll. his passing makes liverpool tick. 2. get toure and cissokho out of the team. they are a massive liability both in posession when liverpool play out from the back and defensively i always feel a mistake is coming. 3. end on a positive, henderson is developing into very good player, has the drive and showed some lovely touches, particularly the pass for the goal from a player whose ‘gait’ is a worry (ahem) and great to have sturridge back, he just has a nose for a goal. Cheers for the reply Dave. You’re dead right to criticise the Liverpool full backs performance in the first 30 minutes. Given that they were free due to Villa’s shape they should have been involved a lot more. Cissokho has indeed had an appalling start to his Anfield career. Amazing to think that he was considered the next big thing when he was at Porto. Agreed wholeheartedly on Gerrard. He was a disaster against Stoke last week. What made it more crazy was that Lucas was playing ahead of him beside Henderson, and he didn’t look comfortable either. Two square pegs in round holes. Henderson looks like a different player when fielded as the most attacking player in a 4-3-3 midfield. His runs from deep have been magnificent this season.